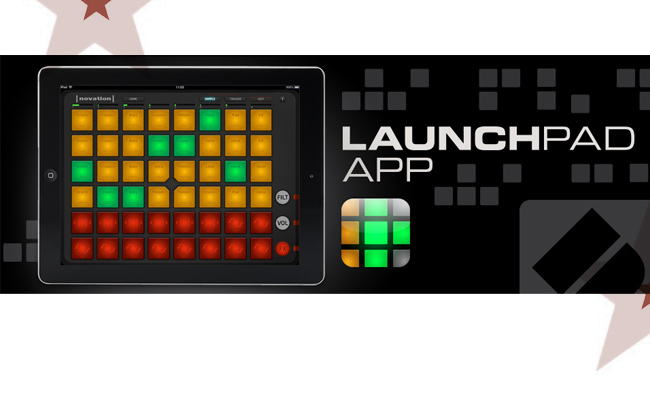 This free app from Novation – Launchpad – definitely has potential. Novation are reknowned for their live performance hardware and software aimed quite squarely at the D.J. Because Ableton have not yet ported their impressive Ableton Live software to the iPad – definitely a real shame – we were looking for an app that could handle live sampling with time stretch and quantize capability to make looping a viable proposition in the live situation. The Launchpad app boasts live time stretching capability – a real bonus for live sampling on the fly if staying in time is parto of your game plan. Straight “out of the box” using the samples that are supplied with the app we managed to knock out some fairly “respectable” techno / drum and bass / house/ dubstep style music immediately – all loops supplied by LOOPMASTERS. Excellent if you like that sort of thing. And YES, all the sounds seamlessly blended together. So far so good if you like making music by pushing buttons. But what about performance with real instruments? It seems Novation have added AUDIOBUS support which is great meaning you can chain the Launchpad together with other apps – but at the time of writing there is no way to load your own samples into Launchpad or record any live instrument performance into the app. NO INPUT……. If Novation add this capability then Launchpad could become the live performance looping solution for iPad – but at the moment it’s just an iPad control surface for LaunchKey – a virtual iPad synth. Launchkey – yes – fun fora few minutes, but, it’s no KORG! So right now unless you want to mess about with the samples supplied with the app this app is nothing more than a toy for wannabe D.J’s. So much potential wasted. Head over to our post about the sampler SAMPLR – intuitive fast and flexible!